The NYS Department of Environmental Conservation and the Land Trust Alliance announced approximately $2.3 million in Conservation Partnership Program grants for 51 nonprofit land trusts across the state. Photo bt Jajean Rose Burney. The New York State Department of Environmental Conservation (DEC) and the Land Trust Alliance this week announced approximately $2.3 million in Conservation Partnership Program grants for 51 nonprofit land trusts across the state. Following Earth Week, a weeklong celebration of New York’s commitment to protecting the environment, the grantees were announced at a statewide land trust gathering in Albany. Seventy grants funded through New York’s Environmental Protection Fund will leverage an additional $2.3 million in private and local funding to support projects that will protect farmland, wildlife habitat and water quality, enhance public access for outdoor recreation, and conserve priority open space areas critical for community health, tourism and regional economic development. In addition, these investments will further land conservation and proactive stewardship practices to enable protected lands to sequester and store carbon. Recent research underscores the role that natural climate solutions will have in addressing the risks posed by climate change. The Land Trust Alliance administers the Conservation Partnership Program in coordination with the DEC. The 15th round of Conservation Partnership Program grants will help local land trusts sustain and expand community and landowner outreach initiatives and develop an array of land conservation, stewardship and education programs. The grants will further regional economic development goals by strengthening partnerships with local and state governments and advancing locally supported efforts to protect working farms, enhance public access and recreation opportunities, and conserve private lands prioritized in New York State’s Open Space Conservation Plan and state wildlife action plan. Land trusts will also apply grant funds to prepare for national accreditation and renewal of accreditation, supporting New York land trust commitments to rigorous national standards for nonprofit governance and organizational excellence. 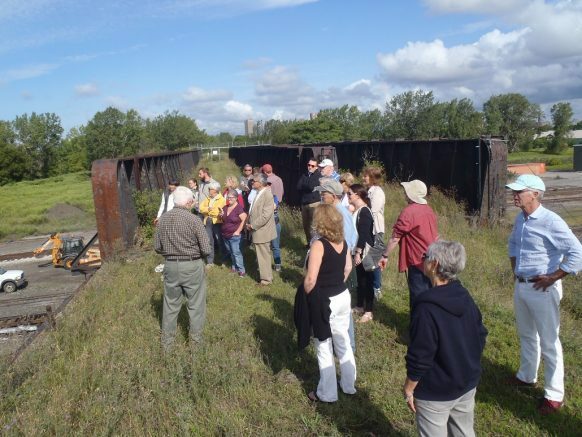 One of the two grants awarded to the Land Conservancy will support a community-driven design competition to generate ideas on how to transform the abandoned the DL&W rail corridor in downtown Buffalo into an accessible linear park with multi-use trails and ecologically diverse wildlife habitat. Over the last few months, the Land Conservancy has been talking with residents, businesses and community leaders about how to reuse the corridor — known locally as the Dell — that runs from Canalside to the Buffalo River near Solar City. The second grant will support the creation of the Margery Gallogly Nature Sanctuary, a more than 140-acre forested wetland property surrounding Assumption Cemetery on Grand Island in the heart of the Niagara River. The Land Conservancy will undertake a community engagement process to plan for and develop public access at the future Margery Gallogly Nature Sanctuary. The Land Conservancy is in the process of finalizing the purchase of this property from Catholic Cemeteries. Since the program’s inception in 2002, the Conservation Partnership Program has awarded more than 820 grants totaling $17.2 million in EPF funds to over 80 different land trust organizations across the state. The state’s investment has leveraged over $19 million in additional funding from local communities and private donors. The 2018-19 State Budget includes $300 million for the EPF, sustaining record level support for environmental funding. The EPF supports state land stewardship, agriculture programs, invasive species prevention and eradication, water quality improvement, municipal recycling and an aggressive environmental justice agenda. New York’s investment in land conservation and open space boosts property values, supports local businesses, saves taxpayer dollars, and protects public health. A study by the Trust for Public Land found that every dollar of investment from New York’s Environmental Protection Fund generates $7 in total economic benefits from tourism, reduced government costs, and public health. The Western New York Land Conservancy is a regional, not-for-profit land trust that permanently protects land with significant conservation value in Western New York for future generations. The Land Conservancy envisions a future in which open spaces, working lands, wildlife habitat, and scenic beauty are cherished and protected as part of the landscape and character of Western New York. The Land Conservancy is accredited by the Land Trust Accreditation Commission and is one of 1,000+ land trusts nationwide, including 90 in New York State. Land trusts have protected 56 million acres of land. For more information on upcoming events, volunteer opportunities, or the mission of the Western New York Land Conservancy, please call (716) 687-1225 or visit www.wnylc.org. Be the first to comment on "Western New York Land Conservancy awarded $85,000 in grants from NYS Environmental Protection Fund"